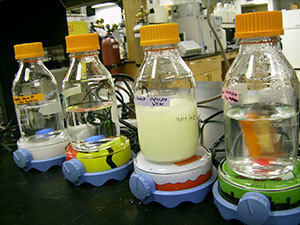 Wastewater samples treated with MBfR. University of Notre Dame researcher Robert Nerenberg can tell you many things you might not know about wastewater treatment plants, including their significant carbon footprint, energy demands and chemical costs. His past research has addressed ways to drastically improve the energy efficiency of wastewater treatment. He now is telling the wastewater treatment industry about his promising new line of research that has the capability of significantly decreasing chemical costs and carbon footprint. Nerenberg, an associate professor of civil engineering and geological sciences, points out that wastewater treatment plants are increasingly using a biologic nutrient removal (BNR) process to protect human health and the environment. This BNR process typically adds an external electron donor, or carbon source, such as methanol or ethanol. However, these chemicals are expensive, have toxicity and handling concerns, and can have a significant carbon footprint. Nerenberg notes that gaseous electron donors have rarely been used in wastewater treatment because of their sparse solubility. However, a new biofilm reactor technology known as the membrane-biofilm reactor (MBfR) effectively delivers gaseous substances directly to the biofilm, bypassing the solubility problems. Hydrogen gas has been delivered to an MBfR to remove oxidized contaminants such as nitrate. Nerenberg is studying the feasibility of using several inorganic or gaseous compounds, such as sulfur, sulfur dioxide, sulfite, hydrogen sulfite and methane, for delivery to MBfRs. Many of these compounds are waste products of other industries and can be much more cost-effective and sustainable than the carbon compounds currently used in BNR processes. Elemental sulfur, for example, is a waste product from a number of industries, including oil refining and coal or gas-burning refining plants, and in many cases these industries would be happy to provide the sulfur for free to entities willing to remove it. The research thus also offers a means to transform a waste product into a valuable resource. 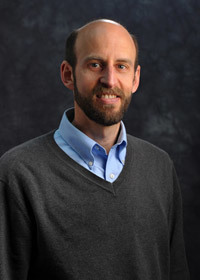 Nerenberg’s research offers such promise that the Water Environment Research Foundation Endowment for Innovation in Applied Water Quality Research awarded him its 2012 Paul L. Busch Award. The $100,000 award recognizes an outstanding individual whose ongoing efforts contribute significantly to water quality research and its practical application in the water environment. The Busch Award Committee identified Nerenberg’s work as feasible and able to demonstrate results and full-scale application quickly. Nerenberg will initially focus his research on sulfur and sulfur dioxide, which have the highest potential for immediate application. And he is already moving the research forward quickly with help from the Hampton Roads Sanitation District in Virginia, where preliminary denitrification tests have been conducted with sulfur and sulfur dioxide. Nerenberg hopes the research will provide the basic information necessary to quickly develop treatment applications and help identify the most suitable reactor configurations, thereby dramatically decreasing operational costs and improving sustainability at wastewater treatment facilities.